If your self care went out the window this holiday season, you’re not alone. It’s easy to get caught up in the busyness and chaos of year end – especially if your holidays involved family, work commitments or travel. It’s also easy to judge yourself for it. But maybe experiencing this chaos and distraction at year end is exactly what we need to re-inspire us to crave getting into alignment, slowing down and just being. Because you know as well as I do, when it all boils down to what’s important, being present to just “be” is what it’s all about. That’s why, as we embark on this new year together, I’m committed to helping you shift from whatever chaos and incongruence is showing up in your life – both on the outside and on the inside – and into more congruence and connection with you. You’ll be getting more from me this month with tools, tips and live talks all centered around helping you calm the chaos, quiet the noise, and get back to basics. 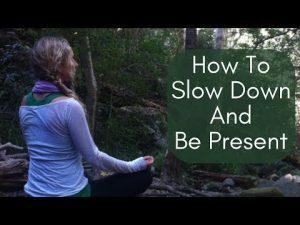 Starting now – with last week’s Facebook video, ‘How To Slow Down And Be More Present Now’. In this video, I share 3 ways you can be more present and connected right now so you can calm the chaos, overcome overwhelm and realign with a more authentic you.